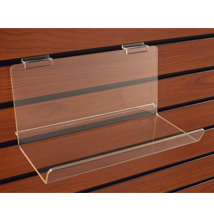 Acrylic slatwall shelving for all of your display needs! These sturdy slatwall acrylic shelves are ideal for books, DVDs and CDs. The 5 in. lip at the edge helps keep your inventory in place. The clear design ensures this slatwall shelving will match your store`s decor. For even more offerings, we encourage you to take a moment to peruse our thorough assortment of slatwall shelving at Specialty Store Services today.